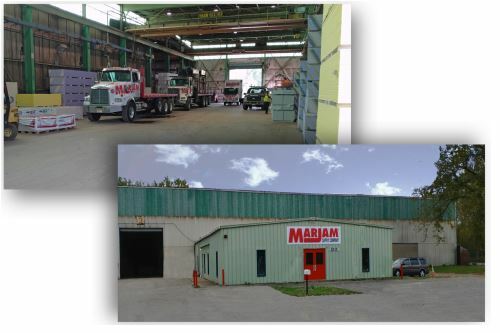 a leading distributor of lumber, plywood, ceiling tiles and systems and other commercial building materials to the trade has opened a new location in Buffalo, New York. Centrally located,1.5 miles from Rte 90 at 2117 Old Union Rd, Cheektowaga, NY- the 35,000 sq. foot, 3 acre location provides local contractors with the highest grade building materials. Marjam believes the expansion is perfectly aligned with the company's mission to drive dramatic growth through sales and service in the Buffalo area. The recently opened and new location for Marjam is fully functioning as they gear up for new business. Marjam's New England regional manager welcomes local businesses, installers and contracting companys to come by to discuss how Marjam can help with any ordering and delivery of material. There will be an 'Open House' in November for vendors to meet with local customers to provide understanding and instruction to some of Marjams great line of products.